Quick to "why" answer: so what is the logical evolution of a Save the Metcalfe a Red Group. If you are interested in topics ... read on. What is a Network Metcalfe? A Save the Metcalfe is a business with a particular structure thus generating value from Metcalfe's Law. 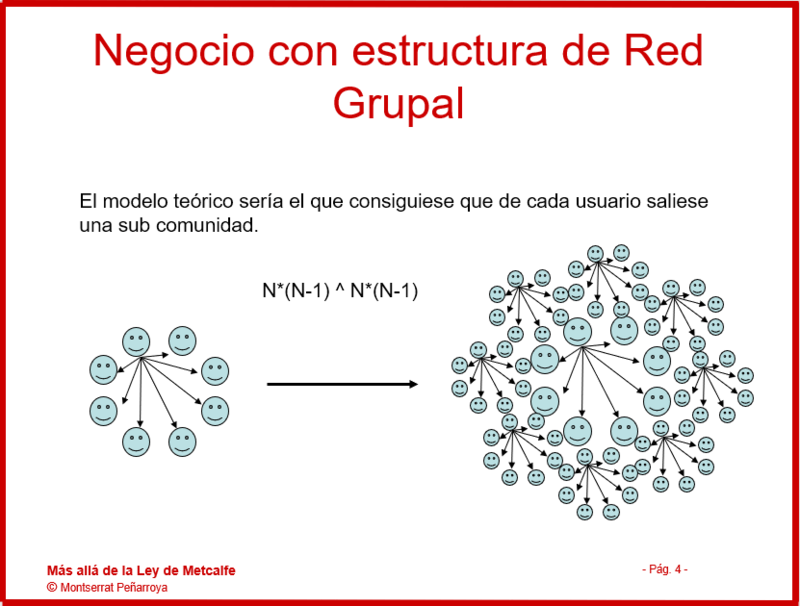 Metcalfe's Law postulates that the value of a network increases as the square of the number of system users. This is not true 100% (after I explain why), but the truth is that this law is of great application to determine the expected growth for a business and creating value that is linked to this growth. The value of this business depends on the number of customers who have (of course, there are more factors that influence business value, but in a hypothetical formula for calculating the value, our "n" is one of the variables ... and it is in this article we will analyze). 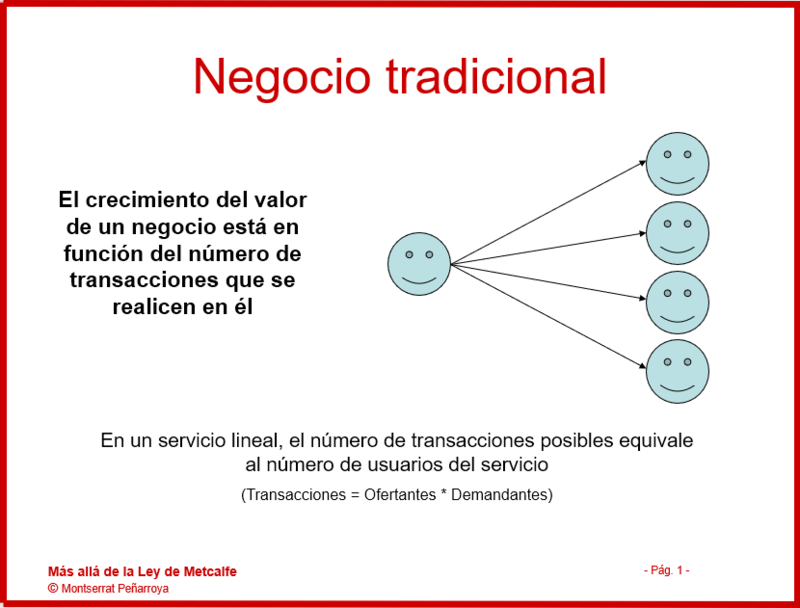 In a traditional business, the number of possible transactions grows linearly. That is: +1 customer equals +1 possible transaction. Hence businesses with circular structures where all users can be supply and demand at the same time, they are called Metcalfe Networks. 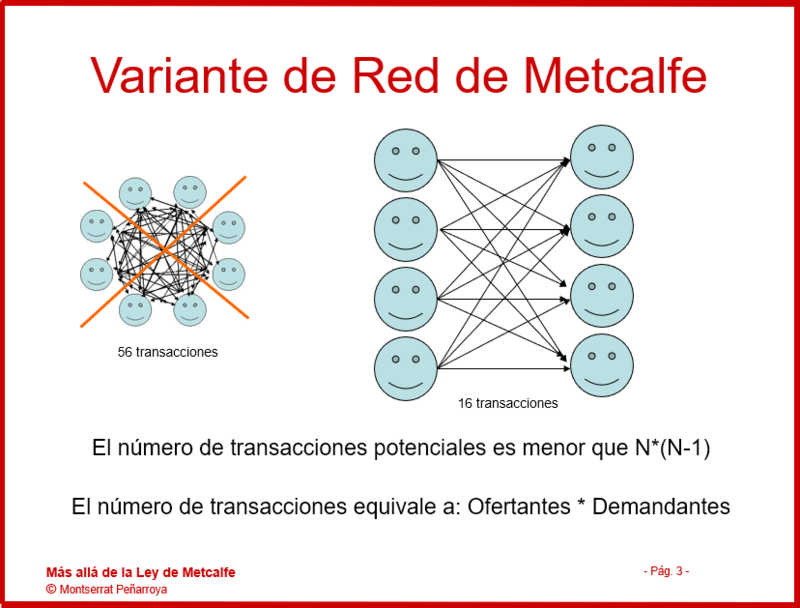 If the number of potential transactions in a perfect network Metcalfe 8 users would be 8 * (8-1) = 56, the number of possible transactions in a network noncircular 8 users (4 suppose that offer and 4 demanding) it would be 4 * 4 = 16 ie the coefficient network externality that market would be 1.33 instead of 2, and therefore value generation grow at lower speeds than those of a Save the Metcalfe perfect since it offers more value to its users, but higher than those of a traditional business that offers much less. In a market like SoloStocks it is interesting to note that the greater the imbalance between the number of bidders users and demanding users, the lower the growth of the business and therefore always have to struggle to balance the number of bidders and plaintiffs . For some time, eBay has been creating or participating in the creation of small sites specializing in certain types of auction and, therefore, has evolved into this model of network structure reminiscent of a daisy. Opening its code, leads to an infinite number of programmers begin to develop applications that revolve around the great network and eventually forming daisy petals. With closed source, only they can create the petals. With open source have a chilling potential of possible petals to be created. Growth Networks group tends to this formula: a ^ n, where "a" depends on the number of possible channels that can be opened, and where "n" is the number of users. The theoretically perfect business would be one that consiguiese that for each user of the main network, possible to create a subnet. Its structure would be something like: n ^ n (I know of none and I'm sure it's just a theoretical model ... but the less, it is interesting to keep in mind). Opening codes applications accelerate this growth, growing "a". What happens when you join several networks Metcalfe? 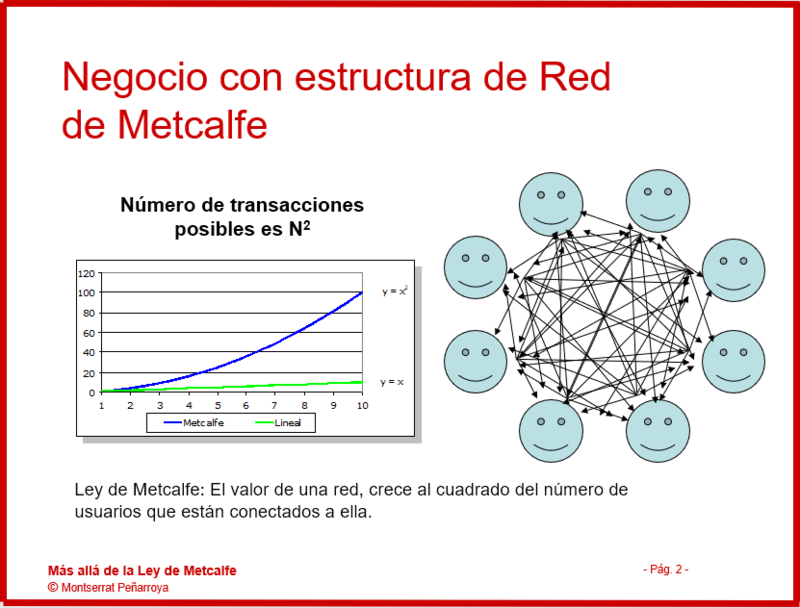 Growth Metcalfe two networks together is greater than the sum of both growth separately. Is not it beautiful to see the word "synergy" represented mathematically?